Elvis Aaron Presley was born on in a two-room house in Tupelo, Mississippi, on January 8, 1935. His twin brother, Jessie Garon Presley, was stillborn. When he was eleven years old his parents bought him a guitar at the Tupelo Hardware Store. As a result Elvis grew up as an only child. He and his parents, Vernon and Gladys, moved to Memphis, Tennessee, in 1948. The young Presley graduated from high school in 1953. That year he stopped by the Memphis Recording Service to record two songs, including “That’s When Your Heartaches Begin”, song #1095 on this Countdown. Elvis’ musical influences were the pop and country music of the time, the gospel music he heard in church and at the all-night gospel sings he frequently attended, and the black R&B he absorbed on historic Beale Street as a Memphis teenager. In 1954, Elvis began his singing career recording “That’s All Right” and “Blue Moon Of Kentucky” at Sun Records in Memphis. In late 1955, his recording contract was sold to RCA Victor. In 1956 he had his first #1 record titled “Heartbreak Hotel”. He had a sound and style that uniquely combined his diverse musical influences and blurred and challenged the social and racial barriers of the time. Bill Haley & His Comets ushered in the rock ‘n roll into mainstream culture in 1955 when “Rock Around The Clock”, appeared in the film about juvenile delinquents and anti-social behavior in an inter-racial school. The song became an anthem for teenage rebellion. However, it was Elvis in 1956 who ensured rock ‘n roll was here to stay with his swiveling hips and R&B infused songs with sexually suggestive lyrics. He starred in 33 successful films, made history with his television appearances and specials, and knew great acclaim through his many, often record-breaking, live concert performances on tour and in Las Vegas. Globally, he has sold over one billion records, more than any other recording artist. In 1958 Elvis starred in his fourth film, King Creole, based on Harold Robbins 1952 novel A Stone For Danny Fisher. The plot concerned a 19 year old male who gets involved with crooks and two women. Nineteen-year-old high school student Danny Fisher works before and after school to support his surviving family: his father and sister Mimi. After Danny’s mother died, his grieving father lost his job as a pharmacist, and moved his impoverished family to the French Quarter in New Orleans. 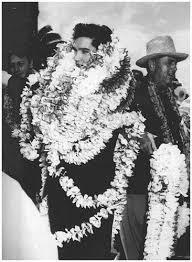 To make the film, Presley was granted a 60-day deferment from January to March 1958 for beginning his military service. Location shooting in New Orleans was delayed several times by crowds of fans attracted by the stars, particularly Presley. The film was released by Paramount Pictures on July 2, 1958, to both critical and commercial success. The critics were unanimous in their praise of Presley’s performance. King Creole peaked at number five on the Variety box office earnings charts for the film industry. The debut single from the film, “Hard Headed Woman”, quickly became a top seller. It was #1 for three weeks in July 1958 on the CKWX charts. King Creole was the fourth of four films in a row whose plot concerned a Presley cast in the role of a musical performer. But though he acted in 31 films, (the 32nd and 33rd being documentaries about his film career), he was increasingly unhappy with the roles he was cast in. When his studio contract ended in after filming Change of Habit in April, 1969, Presley devoted his career to recording and concert appearances. Sergeant Elvis Presley served with the U.S. Army from March 24, 1958, to March 2, 1960. His return to civilian life saw a return to a string of successful single, album and film releases. From April 1960 to March 1961, Elvis topped the Billboard Hot 100 with “Stuck On You”, “It’s Now Or Never”, “Are You Lonesome Tonight?” and “Surrender” for a total of 17 of 52 weeks in that timeframe. The album from his first film on return from serving in Germany, G.I. Blues, was a best-seller at the box office (#2 on Variety Magazine for the year 1960) and a number one album in October 1960. He released His Hand In Mine, a collection of sacred gospel music and in November, 1960, began to record his 13th studio album, Something For Everybody. Something For Everybody contained no single releases. However, in Vancouver the track, “Judy”, got airplay. Though the YouTube.com link above had some photos of Elvis Presley and the lead actress in Jailhouse Rock, Judy Tyler, the song “Judy” is not about Judy Tyler. “Judy” eventually was released as a single in the USA which peaked at #78 on the Billboard Hot 100 in the fall of 1967. That fall and winter the song enjoyed Top Ten chart performances in Oklahoma City, Denver, St. John’s (NFLD), Memphis, Louisville, and over in Australia the cities of Melbourne and Brisbane. The song also charted on the Canadian RPM singles chart, peaking at #39. However, as the song was listed as the B-side to “There’s Always Me”, it never appeared with its’ song title on the chart. 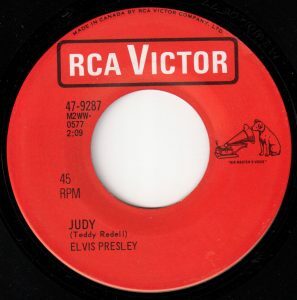 RPM only provided an asterisk indicating the flip side, “Judy”, was also on the chart. In the song the singer confides that he doesn’t know what it is to be alone. In 1961 it was not uncommon for young people, especially in rural communities, to leave their parents home because they were getting married. I certainly know of stories of friends whose parents left home to be married. In one case, their parents had never even slept alone in their own bed until their aging partner had to go to the hospital for a medical emergency. There’s something sweet about longing to be with your partner and being together all the time. But for many people, absence does make the heart grow fonder and some degree of independence within a relationship makes the relationship more dynamic. It’s wonderful to feel loved by someone. Similarly, it is beneficial for most people to take a break for awhile after a dating relationship or a marriage has ended. Knowing what makes you happy and engaged in life, outside of the time you spend with a partner is crucial in a healthy relationship. This was not the advice given in pop songs back in the early Sixties. Paul and Paula in their #1 hit from 1963, “Hey Paula,” advised “True love means planning a life for two, being together the whole day through…” Unless you’re working in a family grocery store, most people would find it just too much to be sharing both a career and family life with the same person on a daily basis year after year. A fulfilling life includes developing your own interests and discovering what makes you come alive, motivated and creative. Becoming the kind of person who is able to initiate and be responsible for taking care of your own life is attractive to others. But if we’re always spending time with our boyfriend, girlfriend or spouse, our own sense of what we want can get fused with our partners wants and needs. If we rely on our partner to fill the void when we don’t know what to do with ourselves when we’re alone, this can become a burden on the other partner. Patterns of neediness can develop and the relationship can become a drain on the partner who is expected to be the source of the others’ happiness. The biggest downside to being afraid of being alone is that you end up dating people who are available the moment you’ve had a break-up who are simply all wrong for you. “Judy” was written by Teddy Redell, a singer-songwriter born in on a farm in Arkansas in 1937 with the name Teddy DeLano Riedel. Teddy’s break came at the age of 15 in 1952 when he was asked to perform on KWCB radio in Searcy, Arkansas, on a program profiling young musicians from area schools. The station was soon flooded with requests for replays of his performance, Steel Guitar Rag. Band leader, Lloyd Sutherland, asked Teddy to join his band for their weekly radio program on KWCB. Redell began playing live shows with Sutherland and his band around central Arkansas. In the winter of 1955, popular country singer and harmonica player, Wayne Raney, of “Why Don’t You brought Teddy to Missouri to appear on his television program on KRCG in Jefferson City. In May 1955, Teddy followed Wayne to Wheeling, West Virginia, where he appeared Saturday nights on “The World’s Original Jamboree” on WWVA radio. In the summer of 1960 Redell had a Top 40 hit in Vancouver called “Pipeliner” which featured Redell’s piano skills. He also recorded his song, “Judy,” as a B-side for a non hit single he released in 1960. After Elvis Presley covered “Judy,” Teddy Redell went on to have a contractual arrangement to write songs for Sonny James. His piano playing skills eventually caught the attention of European audiences interested in rockabilly in the 1980’s. Redell was flown on multiple trips between 1988 and 2002 to the Netherlands, Germany, Sweden and the United Kingdom. He died at the age of 77 in 2014. Elvis had a number of hits in Vancouver that saw little or no chart action on the Billboard Hot 100. This included “Trouble” from the film, King Creole and “C’mon Everybody“, a track from an extended play of four of the twelve tunes in the 1964 film, Viva Las Vegas. “Judy” would have been another example of this except for its single release in 1967, after it was a hit in Vancouver in 1961 where it climbed to #9. Over his recording career Elvis Presley earned 14 Grammy Award nominations including for Record of the Year with “A Fool Such As I” (1959) and “Are You Lonesome Tonight” (1960) and won six Hall of Fame Awards. After his comeback tour in 1968 Presley had continued to tour extensively, with 168 concerts in 1973, a pace he kept through the mid-70’s. By 1976 he was suffering from multiple ailments: glaucoma, high blood pressure, liver damage, and an enlarged colon, all believed to be related to prescription drug abuse. He died on August 16, 1977, and a funeral was attended by over 80,000 mourners. His legacy continues to live on. There were also numerous sightings of Elvis including around the 40th anniversary of his death in 2017. Lichter, Paul. The Boy Who Dared to Rock: The Definitive Elvis. Garden City, NY: Dolphin Books, 1978. Sauer, Wendy. Elvis Presley: A Complete Reference. Jefferson, NC: McFarland, 1984.